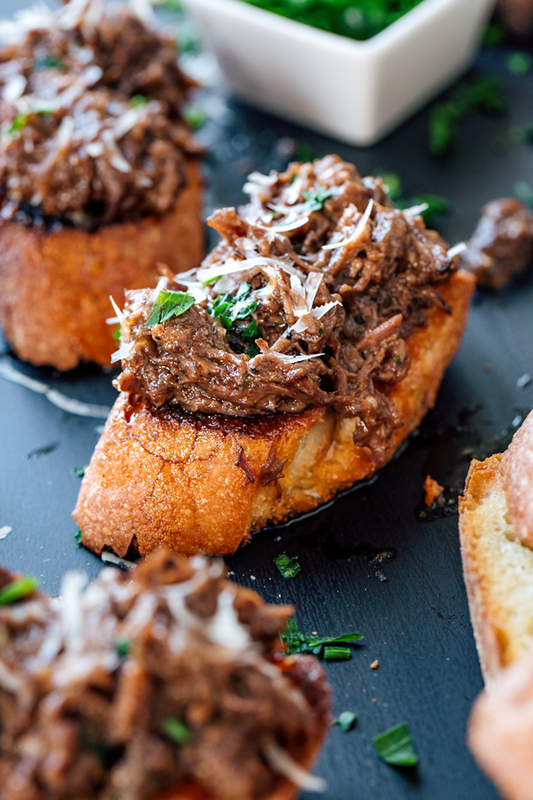 When a scrumptious appetizer or finger food is what you’re craving, then this recipe for braised short ribs on garlic crostini hits the spot perfectly with its rich flavors and simple, yet elegantly rustic presentation. There’s little as romantic and cozy as enjoying a special date night with the one you love in an outdoor cafe, under the twinkling stars. A while back my hubby and I found ourselves in a precious little space like that in Hollywood, sipping some of the most delicious red wine we had ever had between scrumptious bites of various finger foods. And one of those tasty morsels happened to be crisp, golden little crostini served with rich, red wine braised short ribs to spoon over top. The cafe was a little tapas-style place, and their offerings were quite earthy and rustic, which is our favorite type of fare, and these succulent crostini fit that bill delectably. 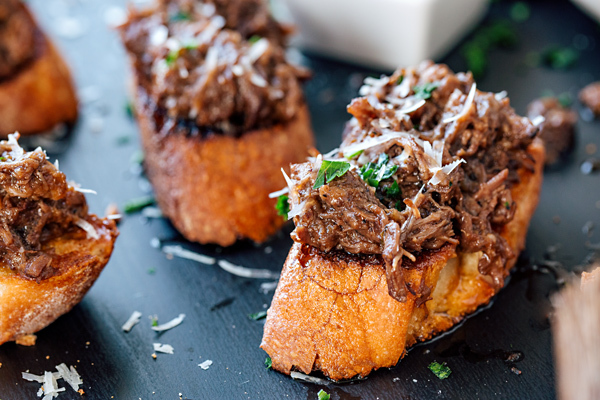 The crostini were toasted to perfection, with a little olive oil and a touch of garlic; and the braised short ribs were saucy with that deep flavor of red wine, finished with a few little soft wisps of finely shredded parmesan and a sprinkle of parsley. Nothing fancy, but the flavor of these coupled with the ambience and the exquisite wine made this date night experience one we’ll never forget. 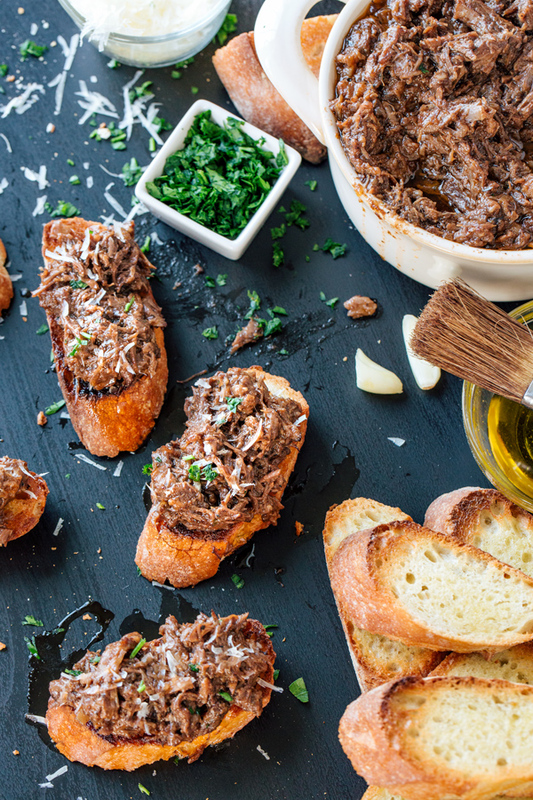 And so in wanting to recreate our special date night, I came up with my own recipe for garlic crostini with braised short ribs, prepared it in our own kitchen “cafe” for a magical evening at home, any time we please. Delicious braised beef short ribs are not difficult to make, they only require a bit of time and patience to simmer and braise away until the meat falls off the bone, succulent and easily shredded. Begin by seasoning the ribs and searing them off until golden-brown in a heavy-bottom pan, and then remove from the pan. Add in your aromatics—your onions then your garlic, followed by the tomato paste; then deglaze with some wine, and add in your beef stock. Add your seared ribs back into your pan, bring to a vigorous simmer stove top; cover, then place into a low-temp oven to braise until fork tender, about 2 ½ hours. Crostini is basically sliced and toasted bread—very quick and easy to make! 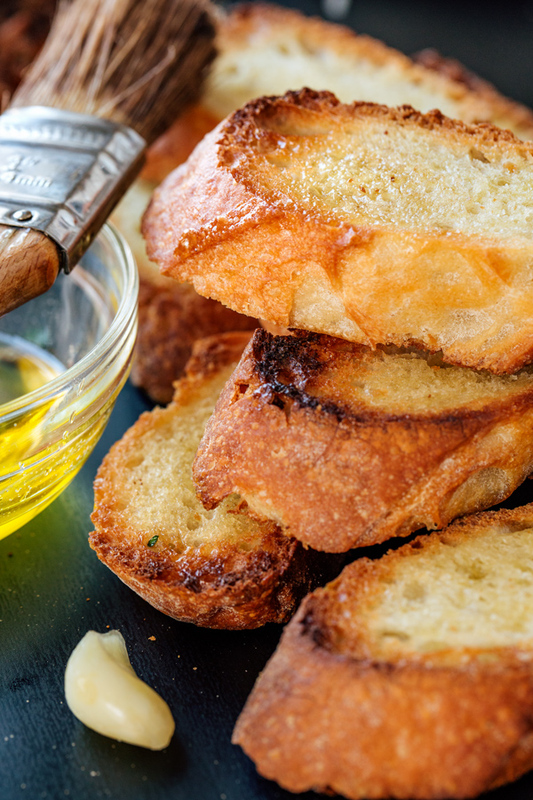 Place slices of fresh bread (large French baguettes are perfect) on a baking sheet, and drizzle both sides with a bit of quality olive oil. Place under the broiler for a couple of moments until golden, then flip the slices over, and toast on the other side. 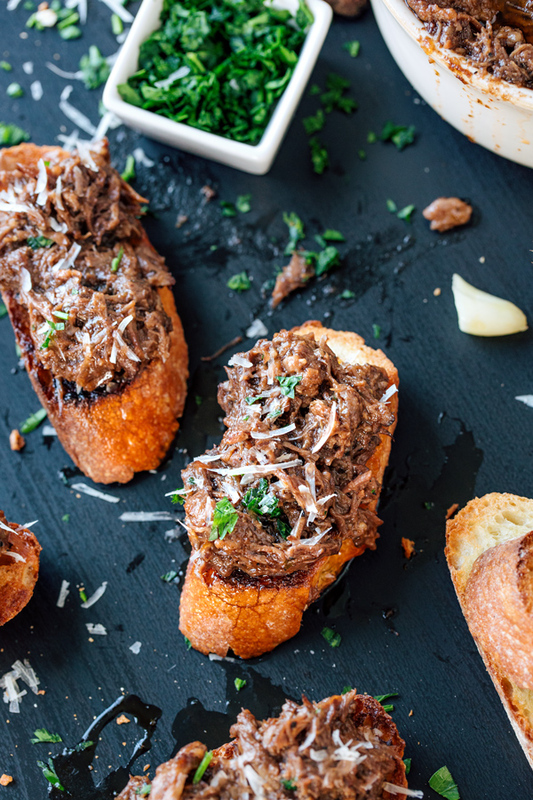 Rub crostini with a clove of fresh garlic, and spoon the braised short ribs, in this case, over top. Smaller ribs make for easier handling: Usually beef short ribs are cut fairly small when packaged; but if you’re asking your butcher to cut them for you on the spot, ask that they be cut smaller. Get your braising pan/Dutch oven nice and hot: Get your pan screaming hot before adding in your short ribs, as this will ensure that they sear and brown nicely, and get a bit of a crust—this provides lots of good flavor in the end. Good quality red wine: I love a good cabernet sauvignon for this recipe, one that I will drink along with the meal; but feel free to use your favorite varietal. Just make sure to purchase a quality that you will be happy to enjoy along with your prepared braised short ribs and crostini. Low and slow: Braising is a wonderful way to cook, because it’s practically effortless once you brown your meat; just set your oven to 325° and allow the short ribs to slowly braise for about 2 ½ hours, until the meat becomes very tender. Skim that fat: Short ribs release quite a lot of fat during the braising process, so skim it out at the end: once braised, remove the ribs and carefully tip the pan to one side allowing the fat to collect on top, and skim as much of it off as you can, leaving the tasty bits and juices behind. -Place the beef short ribs into a large bowl, and sprinkle with a couple of good pinches of salt and pepper, as well as the flour, and toss to coat well. -Place a braising pan or Dutch oven over medium-high heat, and drizzle in about 2 tablespoons of olive oil; once very hot, add the beef short ribs into the pan and sear on that first side until a rich golden-brown, about 4-5 minutes; then, turn the ribs over and brown on the other side; remove ribs from pan. -Reduce the heat under the pan to medium or medium low, and spoon out some of the rib drippings (if necessary), leaving behind about a couple tablespoons worth; add in the diced onion, and saute until golden-brown, for about 5-6 minutes; add in the garlic, and saute just until aromatic, about 30 seconds or so. -Add in another small pinch of salt and pepper, along with the Italian seasoning, and stir; next add in the tomato paste and stir to cook out some of the raw flavor, for about 30 seconds to 1 minute; add in the red wine and allow it to reduce slightly, about 2 minutes. -Stir in the beef stock, and add the short ribs back into the pan, nestling them into the liquid; bring to a vigorous simmer, cover, and then transfer to the oven to braise for 2 ½ hours, or until the meat falls off the bone and easily shreds. -Once braised, remove the ribs from the pan and set them aside for a moment; carefully tip your pan to one side, allowing the fat to accumulate on top, and skim as much as possible out, leaving behind the tasty bits on the bottom and any juices; then, shred the meat and add it back to the remaining sauce to keep warm; stir in the chopped parsley, and check to see if any additional salt/pepper is needed. 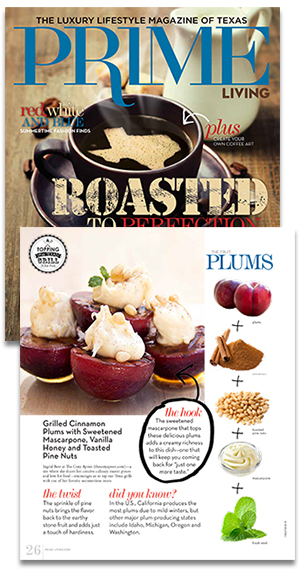 -Set your oven to broil, and line a baking sheet with foil and a wire rack. -Drizzle (or brush on) some olive oil over each slice of baguette, and place under the broiler for a couple of minutes just until the first side is golden (don’t walk away since the slices will toast fast! ); then, flip the slices over and toast a minute longer for the other side to get golden. -Remove from oven and liberally rub the cloves of garlic over each crostini. For more delicious braised short ribs recipes, check out this Braised BBQ Short Rib Sandwich, and this Rich Braised Beef & Porcini Ragu!